DACs: everything you need to know | What Hi-Fi? Built into the likes of computers, tablets and smartphones, the DAC is the fundamental key to unlocking the convenience of digital music - it converts the countless reams of digital information into an analogue signal intelligible to the human ear. Any device that acts as a source of digital sound – be it a CD or Blu-ray player, digital TV box, games console or portable music player – will need a DAC to convert its audio to an analogue signal before it is output. Traditional amplifiers don’t handle digital information, speakers certainly don’t play digital information and our ears cannot interpret digital information – they all need an analogue waveform. Without a DAC, your digital music collection is nothing but a sizeable collection of “0s and 1s” (more on that shortly) that makes sense only within the digital domain. In short, DACs play a large part in making digital music worthwhile. Analogue recordings were stored on the likes of shellac (and later, vinyl) discs, and later still magnetic cassette tapes - but the fragility and unwanted noise of these formats made way for something new. The CD was born, kickstarting the digital audio revolution in the process. DSD, or Direct Stream Digital, is an alternative to PCM and was originally conceived for Super Audio CD (SACDs) - a format championed by Sony and Philips in the late ‘90s and into the ’00s. It’s a much more niche format, differing from PCM by offering a bit depth of just one, but much higher sampling rates - DSD64 at 2.8 MHz and DSD128 at 5.6 MHz. MORE: What is DSD audio? What type of DAC is right for you? DACs come in all shapes and sizes, and offer varying levels of input options and functionality - so you’ll need to think about how you want to use it, not to mention the budget you have set aside. Compact USB DACs offer portability and convenience at a reasonable price. They vary in size between something no bigger than a standard USB stick (such as the Audioquest DragonFly Black) to pocket-sized units that connect via a separate USB cable (iFi's nano iDSD BL, for instance). More often than not they use the power from your computer, so there’s no need for an extra power source. They largely keep connections simple, with just a headphone socket and possibly a line-level output for hooking up to powered speakers or a hi-fi system. If you need more connectivity and are not concerned about taking your DAC around with you, a desktop USB unit - such as the Audiolab M-DAC - might be more suitable. These are usually bigger and require their own power source, but often offer several additional digital or analogue audio inputs alongside a USB input for connecting to your computer. 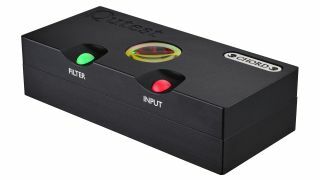 Keep an eye out for a headphone amp if you want to use headphones, as not all DACs offer this as an option - the new Chord Qutest (the replacement for the 2Qute), for instance, is a standalone DAC without any headphone features. Many alternatives offer this functionality these days, though. Finally, there are the DACs that are designed to work as part of a bigger home audio system. These will usually have even more inputs – particularly more niche sockets such as AES/EBU – and, potentially, more features too. They'll support the full range of high-resolution music formats, for example, or offer Bluetooth connectivity for streaming wirelessly from your smartphone or tablet. Some will even come with volume control, so they can be used as a pre-amp too. These can range from the sensible Audiolab M-DAC Plus (£800) to the uber-retro Benchmark DAC3 HGC (£2350), the extravagant Chord DAVE (£7995) or, if money really is no object, the Nagra HD DAC/MPS. Whether you’re spending £100 or more than £1000 on a DAC, we have no doubt the sonic improvements you will hear are well worth a little time spent selecting the right model. Unarguably, the best at the budget end is none other than Cyrus' debut portable DAC, which can turn your mobile listening into an authentically high-fidelity experience for just £100. On the next rung up the ladder is the equally portable and convenient DragonFly Red, which was one of the first on the USB DAC scene several years ago remains a firm favourite today. A brilliantly talented DAC with bags of sonic appeal, the Award-winning Mojo will instantly elevate the performance of your system, be it laptop-based or a traditional hi-fi system. Effortlessly talented and enjoyable, the M-DAC is still one of the best DACs around. Chord's latest and most affordable powered DAC is arguably the pick of its current range. It doesn't have the portability of Mojo or Hugo, but use it in a suitable system and we're confident you'll be wowed. If you're really serious about sound quality and have a not-inconsiderable sum of money to spare, the Hugo 2 is the best gift you can give to your hi-fi.